As demonstrated by the shaded areas in the two range maps below Black Bears, which were once ubiquitous to most of North America, occupy only a small fraction of their historical range. Due to habitat loss and other human factors Black Bears numbers are currently only a fraction of what they once were. Vaughan, M.R., and M.R. Pelton. 1995. Black bears in North America, pages 100-103 in E.T. LaRoe III, ed. Our Living Resources. USDI-NBS, Washington, D.C. Imagine a time of abundance, no not not all you can eat buffets and free soda refills, but a time where animals we share the planet were more than occasional encounters. Bears are relatively common in Southern Oregon where I live. I had no idea their range has decreased so much. Thank you for bringing this to our attention. Hi Karen, it is amazing how much range and along with that range numbers of individual the Black Bear has lost to human intervention. We also have bears in our area, Montana, yet only encounter infrequently. In Switzerland, where I live, there were Brown bears in the past… They hunted them until extinction, as in a lot of other European countries. Now, there are apparently 3 brown bears in Switzerland, that came from Italy… such a sad story! At least there are still black bears in the US, and they are protected in some areas. I still remember the exhilaration of seeing one on my first day visiting Sierra Nevada… what a beautiful animal and moment!!! HI Mercedes, we have both black and brown bears where we live in Montana. It is always wonderful to see them and we need to fight to protect them here. the Brown (grizzly) bear has made a good comeback in our area but there is a big debate happening now as to when people can start hunting them again. The fight for nature is never won, or so it seems, just another battle to be fought. Yes, they need protection, very badly. Beautiful creatures , not to be messed with. Hi Paula, it seems harder and harder to give wildlife the space it needs to thrive given the ever growing number of humans on the planet. I live in Minnesota, just on the edge of where these bears are suppose to be, and I have never seen a black bear. But I suppose they don’t go into the cities much. But when I lived on the farm I didn’t see them either. Hi Stephen, in general Bears like to avoid us humans but we do see them every know and again. 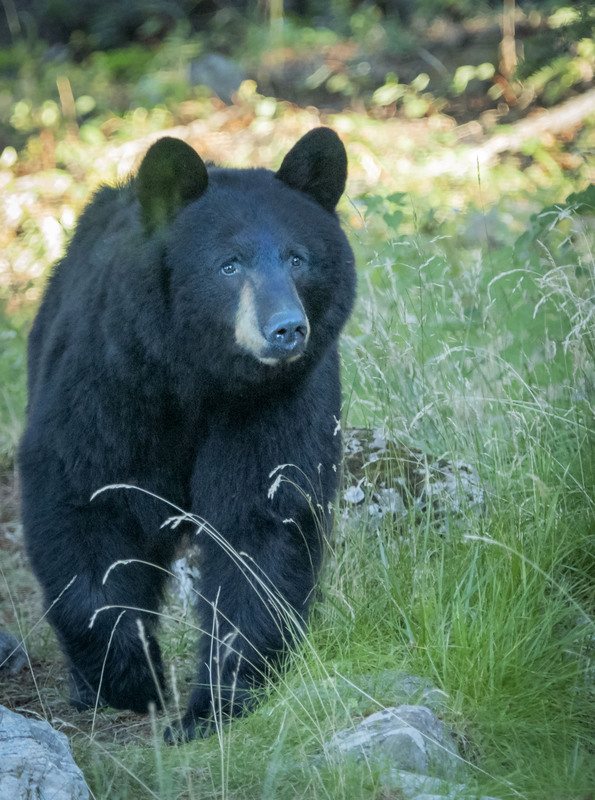 Bears have made a big comeback in our area, but sadly, when a human encounter fails, it is the bear that pays the price. HI eliza, we have a fair number of bears close by and they are indeed making a comeback in many areas but the numbers are still too small.